Difference between revisions of "Grand Theft Auto: Liberty City Stories"
'''Grand Theft Auto: Liberty City Stories''' was the first [[Grand Theft Auto]] game released for the [[PlayStation Portable]]. Set in [[Liberty City in GTA III Era|Liberty City]] in [], it is a prequel to the events of [[Grand Theft Auto Advance]] and [[Grand Theft Auto III]]. The game was later ported for the [[PlayStation 2]]. '''Grand Theft Auto: Liberty City Stories''', also known as '''GTA Liberty City Stories''' and abbreviated to '''GTA LCS''', is the ninth video game in the [[Grand Theft Auto]] series, the fifth of the [[GTA III Era]] and was developed by [[Rockstar North]] and [[Rockstar Leeds]]. [[Capcom]] published and distributed the game for its [[Japan|Japanese]] release. The game was released on October 25, [] in North America and November 4, 2005 in the [[United Kingdom]] on the [[PlayStation Portable]] (PSP). The game, originally a PSP exclusive, was later ported to the [[PlayStation 2]], being released on June 6, [] in North America and June 22, 2006 in the UK. The game has since been re-released as a downloadable game for the PSP Go on October 1, []. The game, set in [[Liberty City in GTA III Era|Liberty City]] in [], was also the first game released on the PSP. 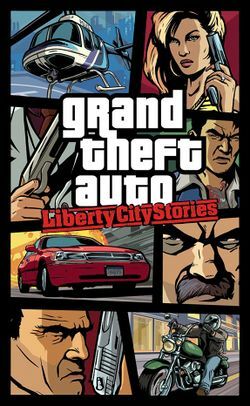 GTA Liberty City Stories serves as a prequel to both [[Grand Theft Auto Advance]] (set in []/[]) and [[Grand Theft Auto III]] (set in 2001). [[Toni Cipriani]], a supporting character from GTA III, returns as the [[protagonist]]. The game features the return of [[Grand Theft Auto III]] supporting character and [[Leone Family]] [[Caporegime|capo]] [[Toni Cipriani]] as the [[protagonist]]. The game starts with Cipriani returning to [[Liberty City in GTA III Era|Liberty City]] after fours years in hiding for killing a made man. Toni, however, is disappointed to find himself back at the bottom of the Leone pecking order, working for his replacement [[Vincenzo Cilli]]. Toni later begins to work his way back up the ladder and against various people in his way, including Cilli, his [[Ma Cipriani|mother]], other mobsters and families, [[Hitmen|hitmen]] and politicians. [[Toni Cipriani]] was forced into hiding after killing a made man. Now he's back and it's time for things to be put right. The streets of Liberty City are in turmoil. Warring mafiosi vie for control as the town begins to self-destruct under waves of political corruption, organized crime, drug trafficking and union strikes. No one can be trusted as Toni tries to clean up the mess of the city's chaotic underworld. Deranged [[hitmen|hit men]], morally depraved tycoons, [[Donald Love|cynical politicians]] and his [[Ma Cipriani|own mother]] stand in his way as Toni tries to bring the city under Leone control. The game returns the player to the crime ridden streets of [[Liberty City in GTA III Era|Liberty City]] but features many differences from previous renditions of the city. The city features new areas to explore, such as [[Fort Staunton]], new gangs, new residents and new means of transportation, including a [[Ferry|ferry]] service from [[Portland]] to [[Staunton Island]]. Motorcycles also make their first and only appearance in the city. Other changes include the [[Porter Tunnel]] and [[Callahan Bridge]] being partially completed, with the later being completed as the game progresses. See [[Liberty City in GTA III Era|Liberty City]]. On the [[PlayStation Portable]], character movement is controlled using the analog stick and the D-pad being used to cycle through the available weapons. The Select button changes the camera mode. To target an enemy, the player holds the R Button and can then cycle through targets using left and right on the D-pad. While in a car, the L and R Buttons can be used for drive-by shootings. While in the midst of a mission, all enemies (that is, those directly relating to the mission) are indicated on the radar by red dots. In the game's menu, the player can choose to reverse the functions of the analog stick and D-Pad. See [[Vehicles in GTA: Liberty City Stories]]. 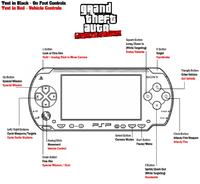 See [[Weapons in GTA: Liberty City Stories]]. See [[Characters in GTA: Liberty City Stories]]. The [[PlayStation 2]] version of GTA Liberty City Stories combines various gameplay mechanics from the PS2 versions of [[Grand Theft Auto III]], [[Grand Theft Auto: Vice City]], and [[Grand Theft Auto: San Andreas]]. Camera control is similar to that of San Andreas, while on-foot movement and gunplay are closer to III or Vice City. However, third-person free-aiming is available in GTA Liberty City Stories, which is used in San Andreas. On the [[PSP]], character movement is controlled using the analog stick and the D-pad being used to cycle through the available weapons. The Select button changes the camera mode. To target an enemy, the player holds the R Button and can then cycle through targets using left and right on the D-pad. While in a car, the L and R Buttons can be used for drive-by shootings. While in the midst of a mission, all enemies (that is, those directly relating to the mission) are indicated on the radar by red dots. In the game's menu, the player can choose to reverse the functions of the analog stick and D-Pad. The [[PlayStation 2]] version of Liberty City Stories combines various gameplay mechanics from the PS2 versions of [[Grand Theft Auto III]], [[Grand Theft Auto: Vice City]], and [[Grand Theft Auto: San Andreas]]. Camera control is similar to that of San Andreas, while on-foot movement and gunplay are closer to III or Vice City. However, third-person free-aiming is available in Liberty City Stories, which is used in San Andreas. The PSP version of GTA Liberty City Stories has a [[multiplayer]] mode, for up to 6 players through wifi ad-hoc mode (same area). The game features 7 modes of wireless multiplayer gaming, in which various pedestrian and character models from the single player mode are available as player avatars. Rockstar removed these modes from the PS2 port of GTA Liberty City Stories. The PSP version of Liberty City Stories has a [[multiplayer]] mode, for up to 6 players through wifi ad-hoc mode (same area). The game features 7 modes of wireless multiplayer gaming, in which various pedestrian and character models from the single player mode are available as player avatars. Rockstar removed these modes from the PS2 port of GTA Liberty City Stories. *The first is [[Liberty City Survivor]], a tie-in to the radio advertisement found in GTA III of a fictional reality television show of the same name. In Liberty City Survivor, players fight for themselves in a deathmatch. The first player to reach a certain number of kills, or with the highest score when the timer runs out is the winner. Players can also play in teams, or "gangs". Ultimately players will be able to choose from over 60 different characters, and play on all three islands, depending on progress through the single player storyline, but from the get go, it is limited to Portland with a generous nine characters to choose from. The first is [[Liberty City Survivor]], a tie-in to the radio advertisement found in GTA III of a fictional reality television show of the same name. In Liberty City Survivor, players fight for themselves in a deathmatch. The first player to reach a certain number of kills, or with the highest score when the timer runs out is the winner. Players can also play in teams, or "gangs". Ultimately players will be able to choose from over 60 different characters, and play on all three islands, depending on progress through the single player storyline, but from the get go, it is limited to Portland with a generous nine characters to choose from. *The second mode of play is [[Protection Racket]], in which players attack an opposing player's gang base in order to destroy four limos while the other gang tries to protect its limos. When time runs out, or a gang destroys the other gang's limos, a new round begins with the gang roles reversed. The second mode of play is [[Protection Racket]], in which players attack an opposing player's gang base in order to destroy four limos while the other gang tries to protect its limos. When time runs out, or a gang destroys the other gang's limos, a new round begins with the gang roles reversed. *In [[Get Stretch]], players try to steal the other gang's gang cars from their base and take it to their base. The game ends when a gang reaches the score limit or time runs out. In [[Get Stretch]], players try to steal the other gang's gang cars from their base and take it to their base. The game ends when a gang reaches the score limit or time runs out. *In [[The Hit List]], players have to kill the Marked player as quickly as possible. Survive as long as possible when you are the Mark. In the first round, one player will be chosen randomly as the Mark, all other players must try to kill the Marked player as quickly as possible. Once a Marked player has been killed, a different player will be randomly chosen to be the Mark. Making a successful kill on a Marked player will award you with extra time that is added to your survival time at the end of the game. Once all players have been Marked and killed, the player with the longest survival time wins. The Marked player's vehicle will take damage over time. In [[The Hit List]], players have to kill the Marked player as quickly as possible. Survive as long as possible when you are the Mark. In the first round, one player will be chosen randomly as the Mark, all other players must try to kill the Marked player as quickly as possible. Once a Marked player has been killed, a different player will be randomly chosen to be the Mark. Making a successful kill on a Marked player will award you with extra time that is added to your survival time at the end of the game. Once all players have been Marked and killed, the player with the longest survival time wins. The Marked player's vehicle will take damage over time. *In [[Street Rage]] players must drive through the checkpoints to get to the finish line first. Players are allowed to change vehicles and shoot other players to win the race. Players will be automatically re-spawned in a vehicle on the track after a short period of time if they do not have a vehicle or if they have been killed. The player that finishes the race first wins. The Sticky Tires powerup improves vehicle handling for limited time, while Instant Repair is just that, an instant repair for your vehicle. In [[Street Rage]] players must drive through the checkpoints to get to the finish line first. Players are allowed to change vehicles and shoot other players to win the race. Players will be automatically re-spawned in a vehicle on the track after a short period of time if they do not have a vehicle or if they have been killed. The player that finishes the race first wins. The Sticky Tires powerup improves vehicle handling for limited time, while Instant Repair is just that, an instant repair for your vehicle. *[[The Wedding List]] is a free-for-all game where players must collect cars scattered throughout the city and deliver them to shipping crates. Only players in the vehicles to be collected will know the destinations of the shipping crates. Cash is awarded based on the condition of the cars when they are delivered. Once all the cars have been collected and delivered, the player with the most cash wins this game mode. [[The Wedding List]] is a free-for-all game where players must collect cars scattered throughout the city and deliver them to shipping crates. Only players in the vehicles to be collected will know the destinations of the shipping crates. Cash is awarded based on the condition of the cars when they are delivered. Once all the cars have been collected and delivered, the player with the most cash wins this game mode. *In [[Tanks for the Memories]] players have to be the first to the tank and try to survive the target Tank Time. Other players must try to destroy the tank before the Tank Time is reached. If this happens, the player who caused the most damage to the tank will occupy a new tank and, as before, it must be destroyed as quickly as possible. This continues until a player reaches the Tank Time; this player is declared the winner. In [[Tanks for the Memories]] players have to be the first to the tank and try to survive the target Tank Time. Other players must try to destroy the tank before the Tank Time is reached. If this happens, the player who caused the most damage to the tank will occupy a new tank and, as before, it must be destroyed as quickly as possible. This continues until a player reaches the Tank Time; this player is declared the winner. A special feature (only in the PSP version of the game) is the ability to listen to custom soundtracks. Previously, only Grand Theft Auto games on the [[Xbox]] and [[PC]] were able to implement custom soundtracks. When Liberty City Stories was released, the custom soundtracks option was featured in the "Audio" section of the menu (by pressing Start in gameplay) but did not have any use. Many people posted on various internet forums asking how to use the feature. At one time, it was thought that these custom soundtrack abilities had to be unlocked, but this would have been very unusual since previous games didn't do this. A special feature (only in the PSP version of the game) is the ability to listen to custom soundtracks. Previously, only Grand Theft Auto games on the [[Xbox]] and [[PC]] were able to implement custom soundtracks. When GTA Liberty City Stories was released, the custom soundtracks option was featured in the "Audio" section of the menu (by pressing Start in gameplay) but did not have any use. Many people posted on various internet forums asking how to use the feature. At one time, it was thought that these custom soundtrack abilities had to be unlocked, but this would have been very unusual since previous games didn't do this. In the application, songs from a CD are ripped, compressed, and converted to files that can be read by the game. Because ''Rockstar Custom Tracks'' (RCT) only allow the ripping of songs that are from a store-bought CD, burning your downloaded songs onto a CD won't work. The only way to bypass this restriction is to use iTunes to put your music on a CD, as RCT recognizes iTunes-burned CD's as store-bought CDs. This was met with much criticism among the fan community. However, fans have found a way to compress and convert MP3 files that are not burned onto CD's. RCT can also look up and use the names from the FreeDB server if there are no names for the song(s). There must be at least one save file in order for RCT to work. It is thought that this will be used for other games Rockstar will release on the PSP from the name. More details can be found in the PDF in the file downloaded from the official site. The game received positive reviews, with a 9.0/10 from IGN. In the United States, the PlayStation 2 version of GTA Liberty City Stories had sold 1 million copies by February 6, 2007, as of December 27, 2007, the PSP version has sold 1.83 million copies and the PS2 version has sold 1.32 million in the United States alone. As of March 26, 2008 GTA Liberty City Stories has sold 8 million copies according to [[Take-Two Interactive]]. See [[Cheats in GTA Liberty City Stories]]. Grand Theft Auto: Liberty City Stories, also known as GTA Liberty City Stories and abbreviated to GTA LCS, is the ninth video game in the Grand Theft Auto series, the fifth of the GTA III Era and was developed by Rockstar North and Rockstar Leeds. Capcom published and distributed the game for its Japanese release. The game was released on October 25, 2005 in North America and November 4, 2005 in the United Kingdom on the PlayStation Portable (PSP). The game, originally a PSP exclusive, was later ported to the PlayStation 2, being released on June 6, 2006 in North America and June 22, 2006 in the UK. The game has since been re-released as a downloadable game for the PSP Go on October 1, 2009. The game, set in Liberty City in 1998, was also the first game released on the PSP. GTA Liberty City Stories serves as a prequel to both Grand Theft Auto Advance (set in 2000/2001) and Grand Theft Auto III (set in 2001). 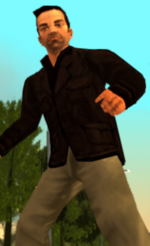 Toni Cipriani, a supporting character from GTA III, returns as the protagonist. The game features the return of Grand Theft Auto III supporting character and Leone Family capo Toni Cipriani as the protagonist. The game starts with Cipriani returning to Liberty City after fours years in hiding for killing a made man. Toni, however, is disappointed to find himself back at the bottom of the Leone pecking order, working for his replacement Vincenzo Cilli. Toni later begins to work his way back up the ladder and against various people in his way, including Cilli, his mother, other mobsters and families, hitmen and politicians. The game returns the player to the crime ridden streets of Liberty City but features many differences from previous renditions of the city. The city features new areas to explore, such as Fort Staunton, new gangs, new residents and new means of transportation, including a ferry service from Portland to Staunton Island. Motorcycles also make their first and only appearance in the city. Other changes include the Porter Tunnel and Callahan Bridge being partially completed, with the later being completed as the game progresses. Control menu of GTA Liberty City Stories in the PSP version. On the PlayStation Portable, character movement is controlled using the analog stick and the D-pad being used to cycle through the available weapons. The Select button changes the camera mode. To target an enemy, the player holds the R Button and can then cycle through targets using left and right on the D-pad. While in a car, the L and R Buttons can be used for drive-by shootings. While in the midst of a mission, all enemies (that is, those directly relating to the mission) are indicated on the radar by red dots. In the game's menu, the player can choose to reverse the functions of the analog stick and D-Pad. The PlayStation 2 version of GTA Liberty City Stories combines various gameplay mechanics from the PS2 versions of Grand Theft Auto III, Grand Theft Auto: Vice City, and Grand Theft Auto: San Andreas. Camera control is similar to that of San Andreas, while on-foot movement and gunplay are closer to III or Vice City. However, third-person free-aiming is available in GTA Liberty City Stories, which is used in San Andreas. The PSP version of GTA Liberty City Stories has a multiplayer mode, for up to 6 players through wifi ad-hoc mode (same area). The game features 7 modes of wireless multiplayer gaming, in which various pedestrian and character models from the single player mode are available as player avatars. Rockstar removed these modes from the PS2 port of GTA Liberty City Stories. An example of multiplayer options menu of GTA Liberty City Stories in the psp version. When the option Custom Tracks is not enabled, appear not available..
A special feature (only in the PSP version of the game) is the ability to listen to custom soundtracks. Previously, only Grand Theft Auto games on the Xbox and PC were able to implement custom soundtracks. When GTA Liberty City Stories was released, the custom soundtracks option was featured in the "Audio" section of the menu (by pressing Start in gameplay) but did not have any use. Many people posted on various internet forums asking how to use the feature. At one time, it was thought that these custom soundtrack abilities had to be unlocked, but this would have been very unusual since previous games didn't do this. The game received positive reviews, with a 9.0/10 from IGN. In the United States, the PlayStation 2 version of GTA Liberty City Stories had sold 1 million copies by February 6, 2007, as of December 27, 2007, the PSP version has sold 1.83 million copies and the PS2 version has sold 1.32 million in the United States alone. As of March 26, 2008 GTA Liberty City Stories has sold 8 million copies according to Take-Two Interactive. This page was last modified on 29 March 2012, at 21:45.